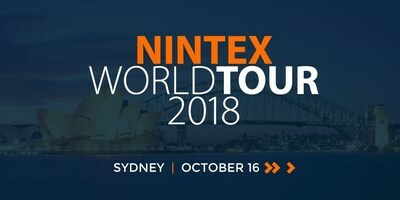 SYDNEY, Oct. 2, 2018 /PRNewswire/ -- Nintex today published the agenda for its upcoming Nintex World Tour event in Sydney. The one-day conference will showcase how Australian private sector financial services organisations and a leading construction company are digitally transforming operations with process management and automation solutions from Nintex and Promapp. Visit http://www.nintex.com/NWT-Sydney to register for the Nintex World Tour event on Tuesday, October 16 at the Hilton Sydney hotel from 8:30 a.m. to 4 p.m. AEST. Built, one of Australia's largest private construction groups needed to automate and control the issuance of security bonds required for its construction projects. Chris Vella, Group Treasurer at Built, and Drew Keenan CEO of Total Calibration, will share how Total Calibration used Nintex to deliver an automated and integrated application process for the request, approval and generation of securities for Built. Auswide Bank with more than 50 years of history providing personal and business banking products and services to customers originating in regional Queensland and now with a lending presence Australia-wide supported through branches, business bankers, accredited mortgage brokers and online, is on what it calls a "Road to Right." Michelle Ashwell, Head of Customer Operations, and Tori McLennan, Head of Support Services Re-engineering from Auswide Bank will share how they are using Nintex and Promapp to improve the advocacy and ownership of processes within the organisation, automate various business processes, and more. "We're using Nintex and Promapp to support a positive process improvement culture at Auswide Bank. Promapp has been integral to increasing the accessibility, control and audit trail of process changes, with Nintex supporting the workflow automation of various business processes," shares Michelle Ashwell, Head of Customer Operations at Auswide Bank. "We're looking forward to sharing what we call our 'Road to Right' journey." Today the Nintex Platform includes powerful, easy-to-use capabilities for process mapping and management, modern forms, advanced workflow, document generation, process intelligence and more. End users save an average of 60 minutes for every complex process automated with Nintex's platform according to a Forrester Total Economic Impact™ Study. Nintex is the global standard for process management and automation. Today more than 8,000 public and private sector clients across 90 countries turn to the Nintex Platform to accelerate progress on their digital transformation journeys by quickly and easily managing, automating and optimising business processes. Learn more by visiting www.nintex.com and experience how Nintex and its global partner network are shaping the future of Intelligent Process Automation (IPA).